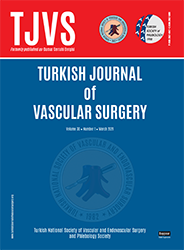 2Department of Cardiovascular Surgery, Bağcılar Training and Research Hospital, İstanbul, Turkey DOI : 10.9739/tjvs.2019.267 Objectives: This study aims to analyze the midterm results of directional atherectomy (DA) in patients with femoropopliteal occlusive disease. Patients and methods: Data of a total of 21 patients (20 males, 1 female; mean age 59.7±7.9 years; range, 45 to 77 years) who underwent DA between June 2014 and December 2016 were retrospectively analyzed. The demographic data, symptomatic classifications (pre- and postoperatively), and lesion types were recorded. The pre- and postoperative patency rates were compared using computed tomography angiography and Doppler ultrasonography. Results: Technical success and clinical improvement were obtained in all patients. One patient (4.8%) required reintervention of the target lesion and another patient (4.8%) required below-the-knee amputation during follow-up. The mean duration of amputation-free survival was 1.6±0.8 (range, 0.4 to 2.8) years. The six- and 12-month major amputation-free survival rates were 100% and 94.1%, respectively. No procedure-related mortality occurred. The mean duration of patency was 1.4±0.9 (range, 0.1-2.7) years. The mean duration of target vessel revascularization-free survival at one, two, and 2.5 years were 93.3±6.4%, 93.3±6.4%, and 62.2±25.8%, respectively. Claudication recurred in seven patients (33.3%). The mean duration of claudication-free survival was 1.4±0.9 years. Tobacco use was the only statistically significant factor for re-claudication (p=0.047).